Our booking system allows you to book a holiday (including lift passes and ski hire) using real-time, live availability. To start, click on the week you'd like to book. If you have any questions, please don't hesitate to call us on 01302 328820. We offer a fantastic range of Salomon adult and child skis, boots, and helmets for hire directly in (or very near to) your chalet. Prices range from €35 to €95 per week. Browse the full selection when making a booking or even add equipment hire to an existing booking simply by logging into our system. We can also deliver your ski passes directly to your chalet on the first morning to avoid those lift office queues. Simply select the passes you wish to order during your booking process, or add them to existing bookings. 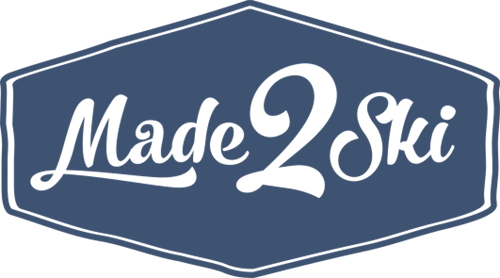 We are proud to introduce made2ski.com, our partner ski apparel shop. We offer a great selection of ski and snowboard outerwear, streetwear, and accessories from Salomon at fantastic year-round discounts. Visit today! *Manchester flight entails a supplement of £35. We also offer in-house ski hire and lift passes. To price out a complete holiday, simply click on a week on the left.